I have seen so much confusion over EOS DSLR camera focus modes, that I have written this post, to help you choose the right focus mode. One of the major reasons that folks come to my workshops for the advanced cameras is to learn how to set-up and get the best from the advanced AF systems. I have found that some a reminder of the focus mode choice before moving to advanced settings. 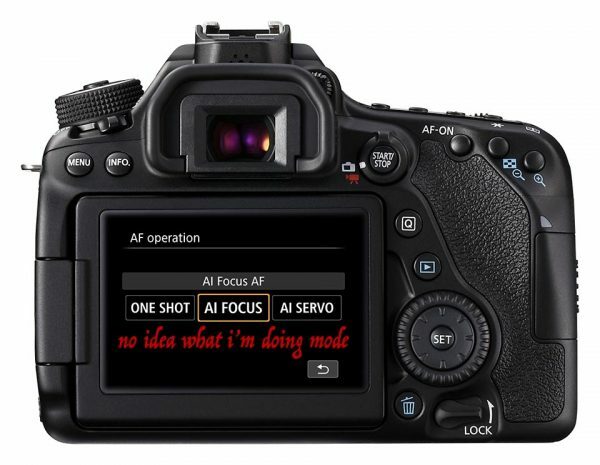 All EOS DSLR cameras, except EOS-1D models, have three focus modes. I really wish it was only two, but more on that later. These settings are only used when you are using the optical viewfinder, they are not selectable if you are using the LCD to compose your pictures in Live View mode. ONE SHOT is for static subjects, stuff that doesn’t move. Typical subjects for ONE SHOT are landscapes, portraits of people standing around, still-life, product shots, scenic shots. With ONE SHOT, you can focus the camera on the subject, when the camera thinks focus is achieved it locks the focus. While you keep your finger on the shutter button in the “half-pressed” position there’s no more focus happening. ONE SHOT gives you the chance to use the focus, lock and recompose technique. Once the focus locks, you keep your finger on the shutter at the half-pressed position, and can move the camera to choose the best composition of your picture. This is why you see some photographers, half-press the shutter, their camera beeps, and then they move the camera a little before taking the picture. AI SERVO is for moving subjects, stuff you want the camera to track continuously. Typical subjects for AI SERVO are sports, wildlife, action, kids playing, aircraft flying, birds flying. With AI SERVO the camera starts focussing on the subject when you half-press the shutter and keeps on changing the focus as the subject moves. The AI in the name standards for artificial intelligence. The camera knows how long it takes between you pressing the shutter button all the way down, and moves the focus a little more to allow for that time before the picture is actually made. In effect the camera deduces how fast the the subject is moving and factors this in. So that’s it choose moving or not! I wanted to stop at this point, all the info you need is already written. If you have to leave AI Focus on the camera, please create a custom function to turn on AI FOCUS mode. Make it so the default is that AI FOCUS is not available to choose in the creative modes, P, Tv, Av, M etc. AI FOCUS is for photographers who have no idea what they are doing, and have no idea if the subject is moving or not… Seriously if you don’t know if a subject is moving, or not, shoot with your phone. Typical subject for AI FOCUS, none. However so many photographers use it for everything! AI FOCUS starts out by assuming the subject is not moving, kind of like ONE SHOT, however if it then thinks that the subject starts moving it “may” switch to AI SERVO and start tracking. You have no idea which kind of focus you have, and no control over the camera decision. I have seen cameras that switch to tracking focus when you recompose in AI FOCUS mode, then they focus on the wrong subject. The photographer was asked by his wife to take some pictures of her as she finished her first marathon race, 40km/26miles. He got a good place by the finish line. Waited until his wife came in to view after running 26 miles and hit the shutter. The camera started taking shots. Wife runs towards the camera, she’s right in the middle of the frame with a huge smile of joy, relief, achievement on her face. Photographer is over the moon, happy that his wife completed this marathon, and still had time to smile for her pictures. On arriving home, the photographer loads the pictures on his computer and starts to check through them… The first shot in the sequence is ok, she’s a bit distant and you can’t see the big smile on her face yet. She hasn’t seen him behind the camera. Then as she gets closer the smile happens, she looks amazing. The photos keep coming, and the focus is locked on the barriers 40 feet / 15 metres behind her. The photographer lived long enough to send me some pictures, and ask how was it possible that his camera had made his life hell. A check of the embedded metadata revealed AI FOCUS. You got it, the camera decided that the nice contrasty lines of the barriers in the background were better subjects and locked on them and stayed using the one-shot focus. All the EOS cameras, except the EOS-1D models, have full auto mode, the green square setting or scene intelligent auto. When you choose this you have basically chosen to let the camera make all the photo decisions for you… You simply point and press. But if you bought an SLR to make amazing photos, then this is not for you… it is for when you hand the camera to a random person nearby, and ask them to take a photo of you, the kind of photo that you would use a phone for. Manual focus – yes you can choose manual focus by setting the switch on the lens to MF, using a TS-E lens or MP-E lens. It might be fair to think of MF as a fourth mode, but it’s not an AF mode, so I haven’t. Love your articles! And your sense of humor! Thank you!